When you think of Victoriana, your minds fills with frills. White balconies, brick laced with ivy and china teapots set a dainty, wealthy scene. These visions forget the real Victorian times – the times that inspired steampunk; the times that saw cobblers and blacksmiths; the times that saw the invention of the steam train. 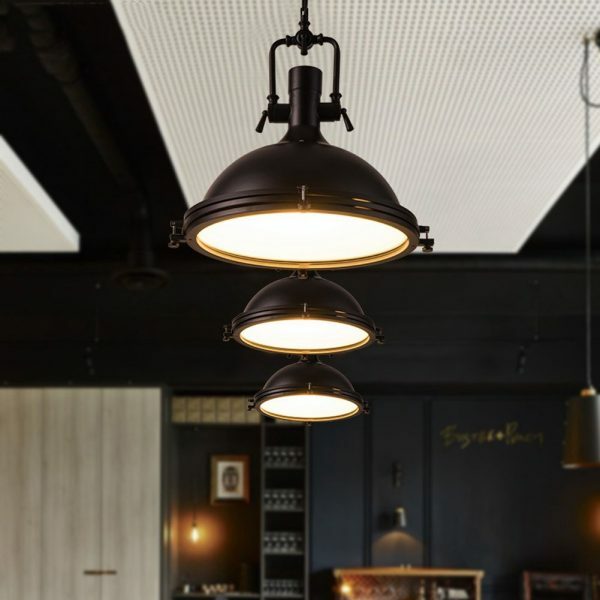 These 30 industrial lighting fixtures take you back to when technology changed the way you lived. 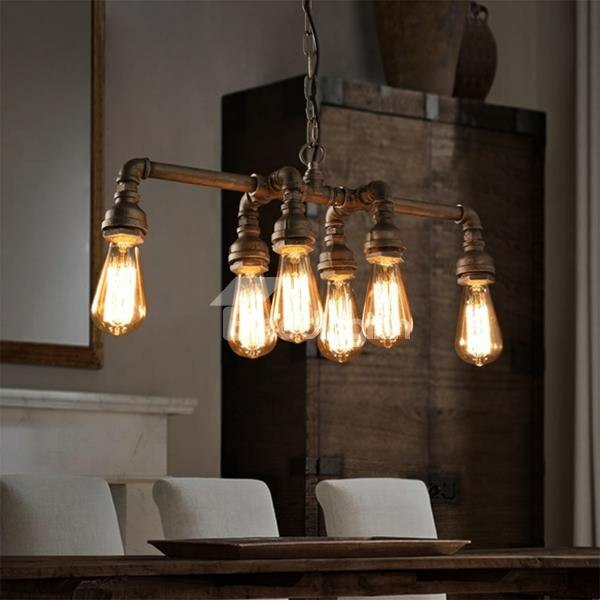 Wrestle with a pipe light above your dining table. House a pipe-made robot upon your desk. 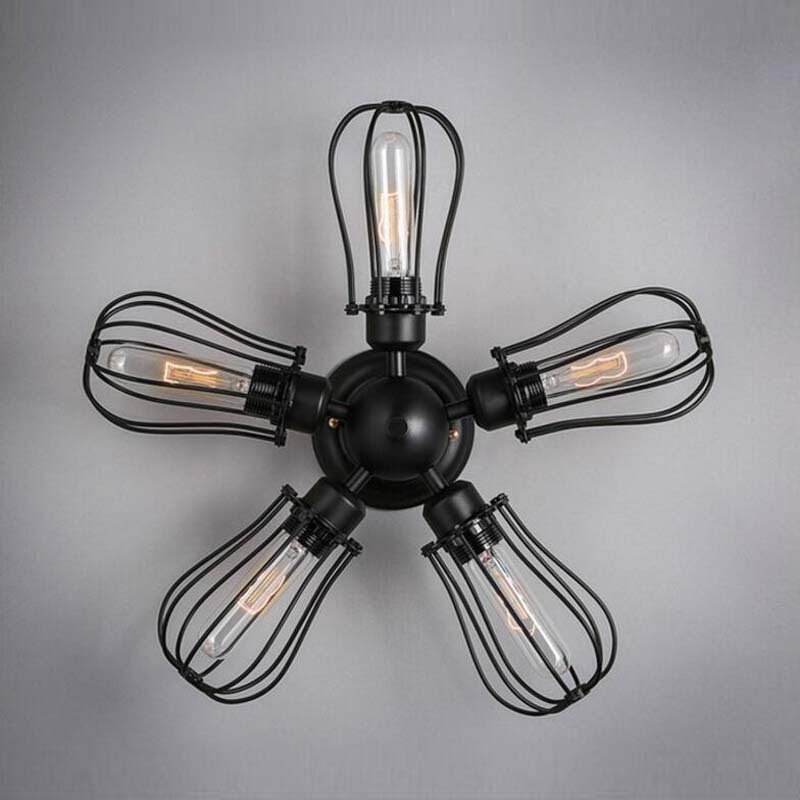 Greet guests to your place with a wrought iron chandelier. 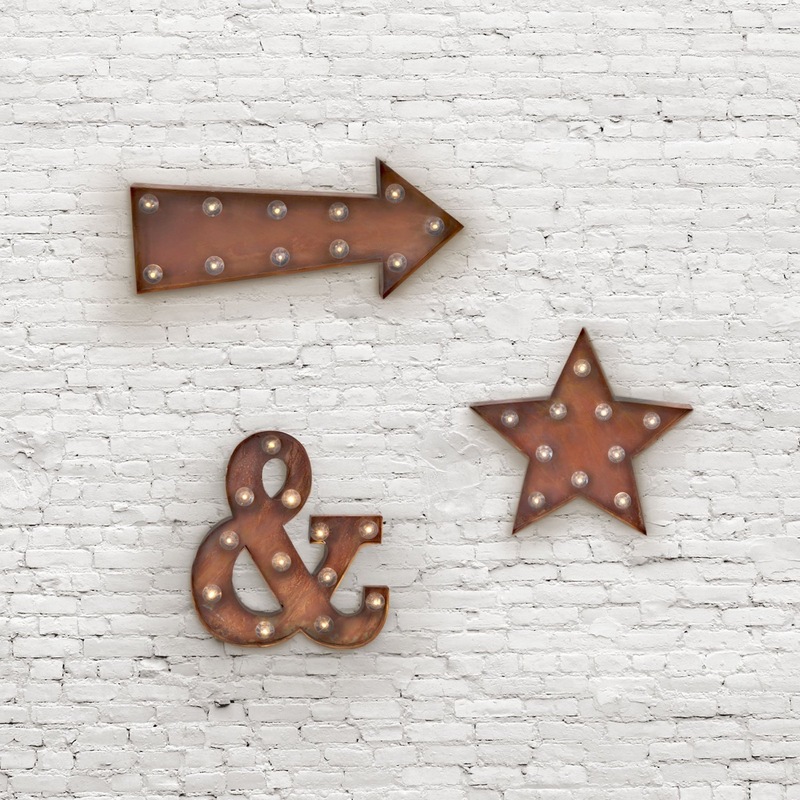 Make your home truly Victorian with our picks for an inspired industrial interior. Industrial-Style Table Lamp: Making your home Victorian can begin in the home office. 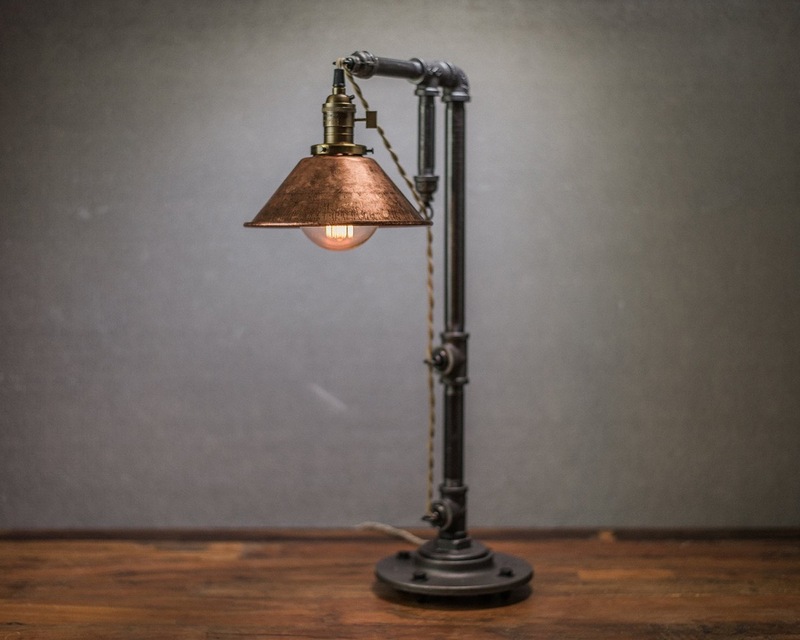 This copper-domed find harks back to the past with a copper dome, pulley and heavy black iron fittings. A cloth-covered power cord polishes off the look. Industrial Robot-Like Lamp: Fancy a lamp with more personality? 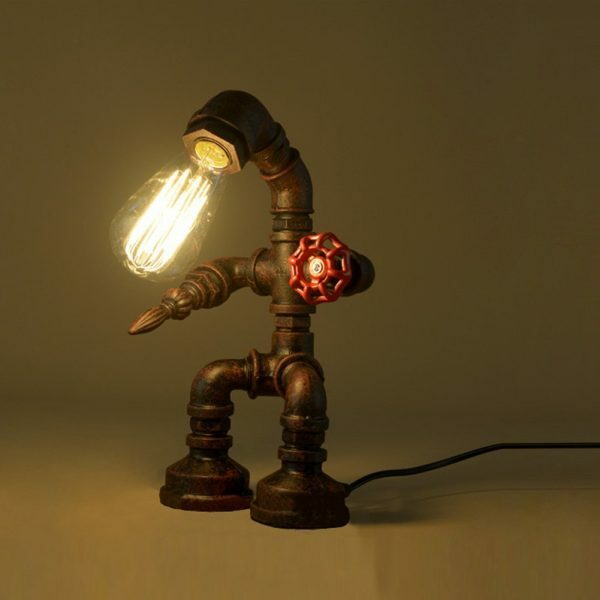 This robot replica offers a LED bulb for a head and a valve for an arm. 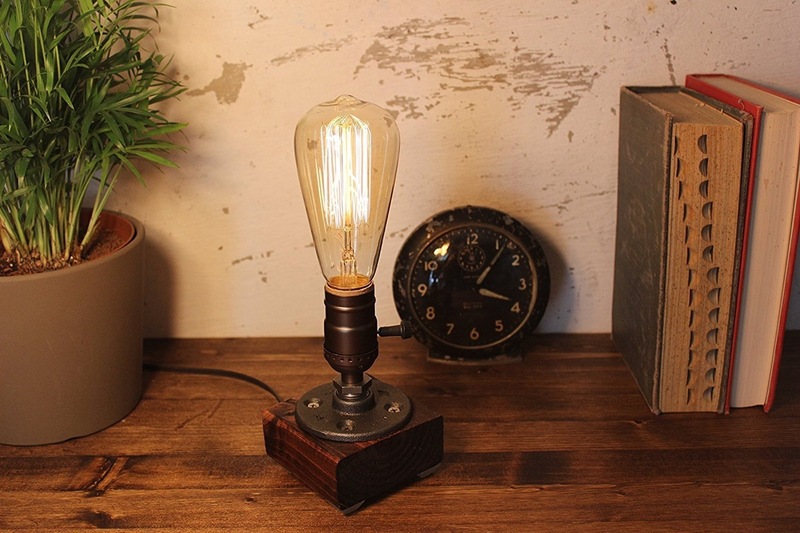 32 centimetres high, he’ll make a steampunk scene on your work or home office desk. 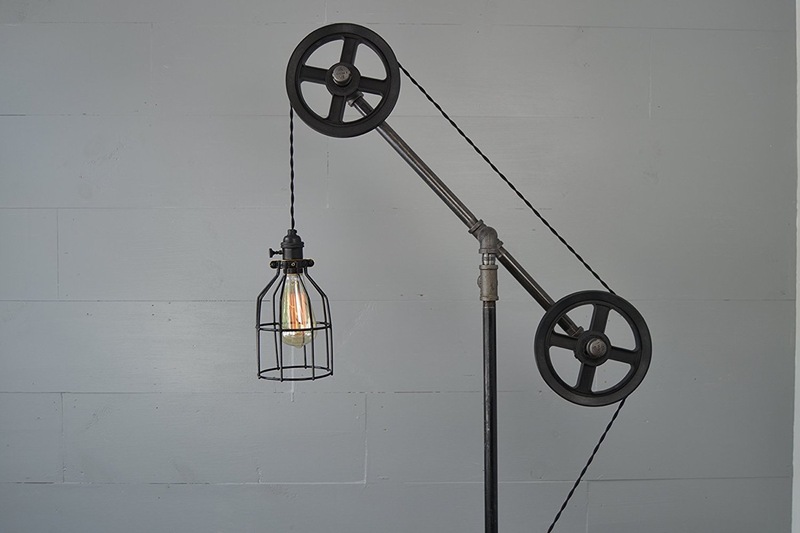 Industrial Bedside Lamp: Edison invented the light bulb, and in this piece with his creation, one of our most unique table lamps. With a bed of red mahogany, all electrical components (including the bulb) are UL-listed. 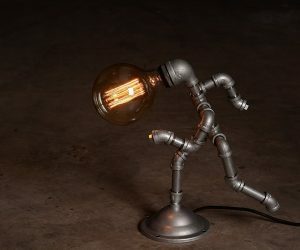 Running Man Industrial-Style Bedside Pipe & Socket Lamp: Crafted from a range of iron plumbing fixtures, this running man sprints from one household to another. 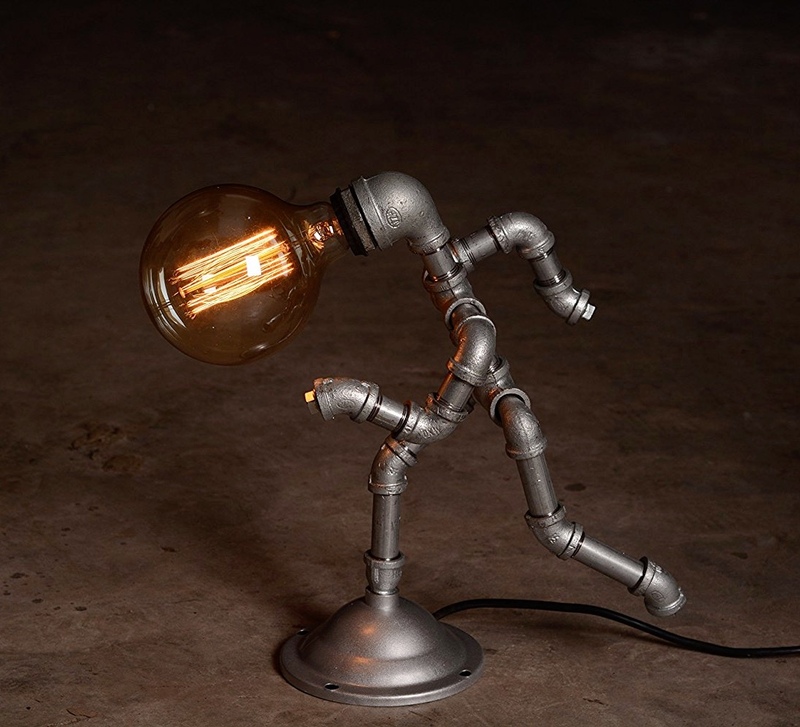 Use this unusual form as a bedside table lamp, for morning jog inspiration. Industrial-Style Floor Lamp With Pulleys: Pulleys adorn this floor lamp with street-style lantern. 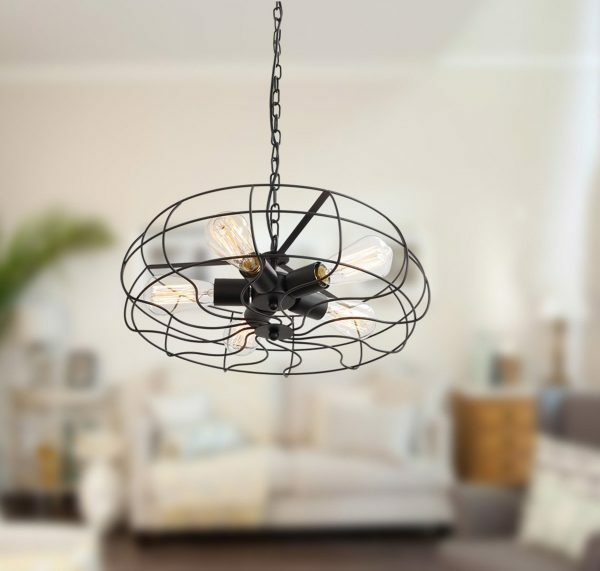 Made of twisted steel, its metal grate encases the light, while adding some serious industrial impact to your living room. 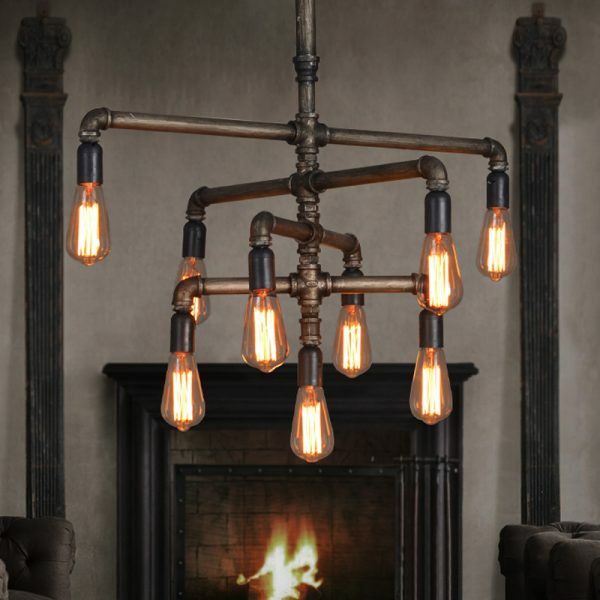 Industrial-Style Adjustable Pipe Chandeliers: Looking for a chandelier without a trace of bling? 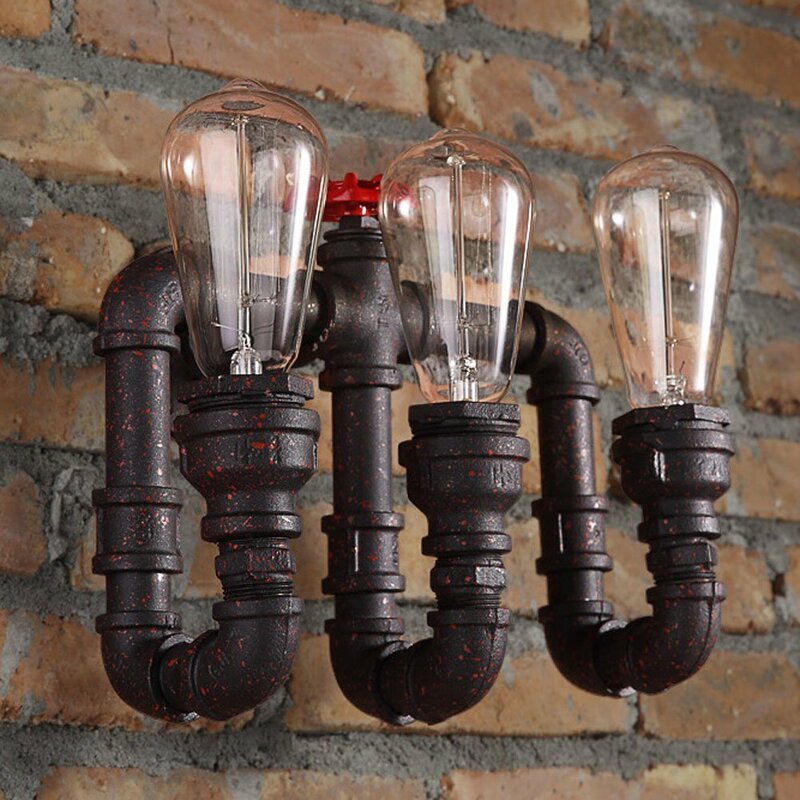 This painted copper find boasts nine lights dangling from tap fittings. 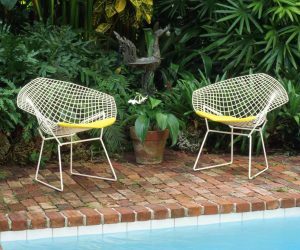 Give it breathing space in your living or family room. Six Light Piping Chandelier: Easy to install with a vintage look, this six light find turns it down a notch. Its 52-inch chain hangs its glow close to an intimate dinner table gathering. 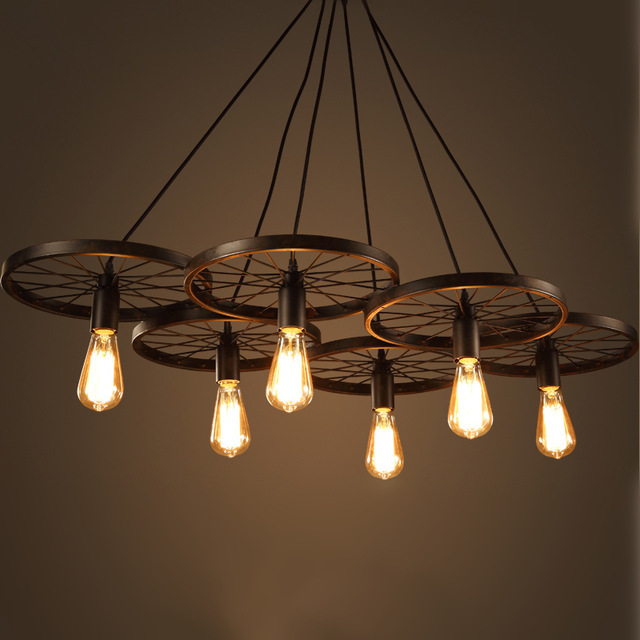 Industrial-Style Chandelier: Bike lovers would excel with this six-light chandelier made from bike wheels. 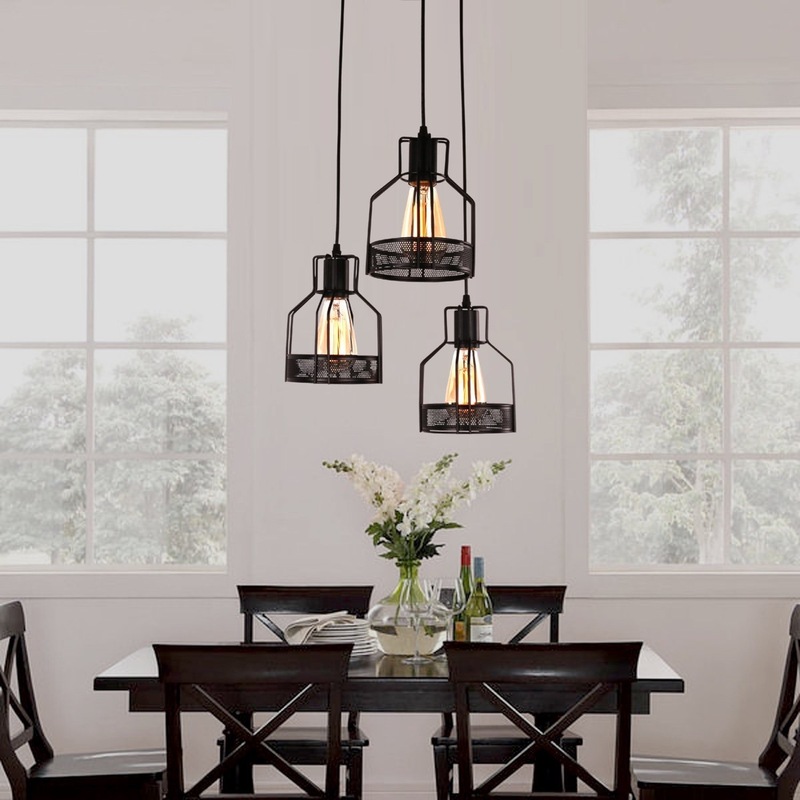 Its wrought iron frames hang from a central point, creating a triangular shape perfect for illuminating dinner tables. Industrial-Style Rope Pendants: There’s no doubt that these hemp rope lights offer a different way to light a room. 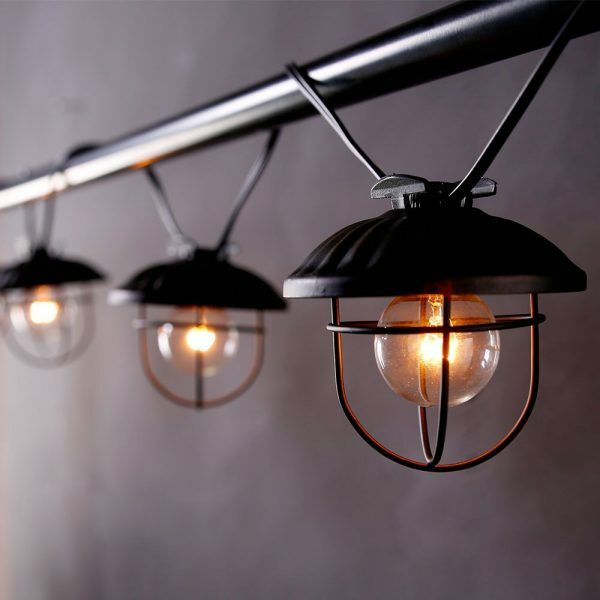 Drape them across hanging bars or as an ornament on a table, for an eye-catching way to diffuse the dark. Modern Industrial Pendant Lights: Let frosted light coat your kitchen table, with this set of three pendant lights. Made of metal, they offer adjustable holders that twist, turn and tilt your light to the right angle. 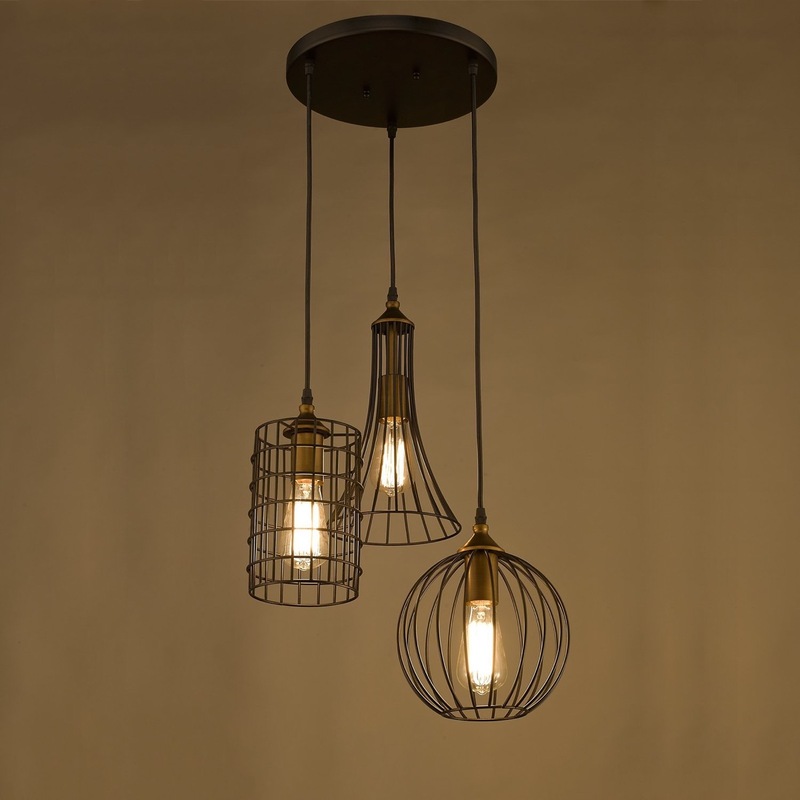 Industrial Dining Pendants: This set of three cages come with a two-year warranty. 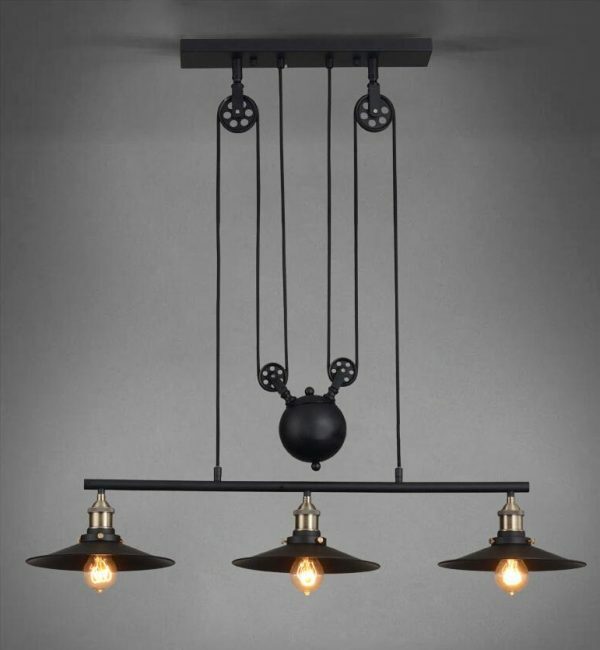 Hanging from different heights, their metal design would work well over a dining or kitchen table. 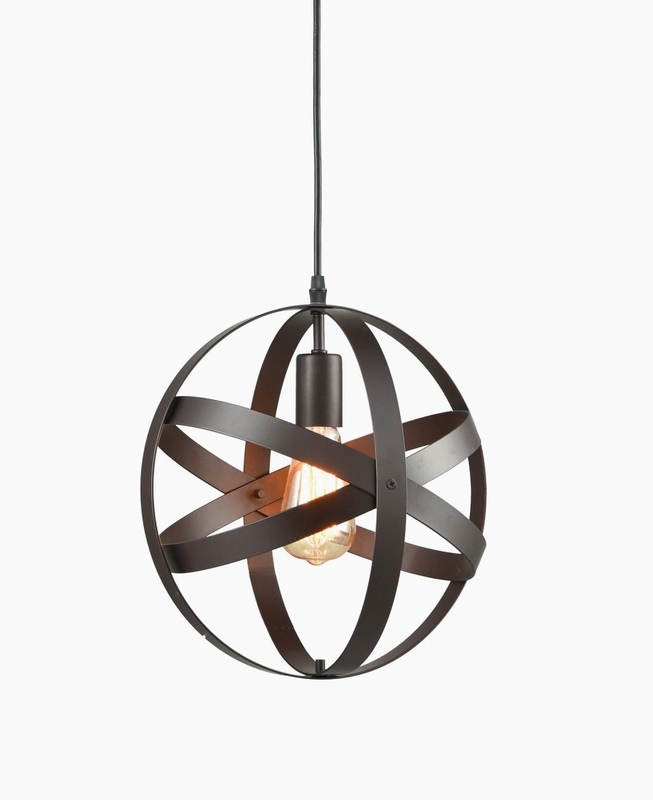 Industrial Spherical Pendant Light: Make it circular with this metal light of spherical angles. Its screws turn to enable different combinations – and refractions – of the way you see your light. Industrial-Style 5 Light Chandelier: Encased in a fan-style design, these five lights shrouded in metal add warmth to your room. Take advantage of its two-year warranty for an easy add to an industrial interior. 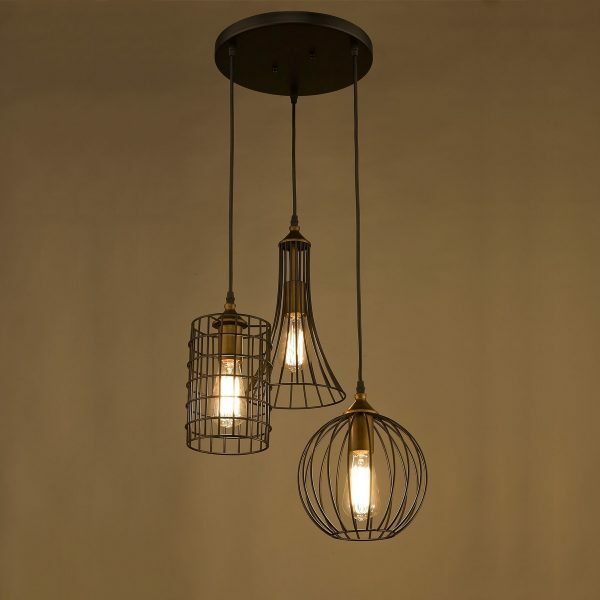 Vintage Industrial-Style Pendants With Wire Cage: More cages abound, with this set of three lights in different designs. Created from oil-rubbed bronze, they create a nifty chandelier for your bedroom, kitchen or dining room ceiling. A 1200mm black cord lets you adjust the length. Industrial Pipes With Valves Pendant Lighting: Still finding your chandeliers too pristeen? This industrial find boasts three lights, three valves and a design not amiss for the modern man cave. 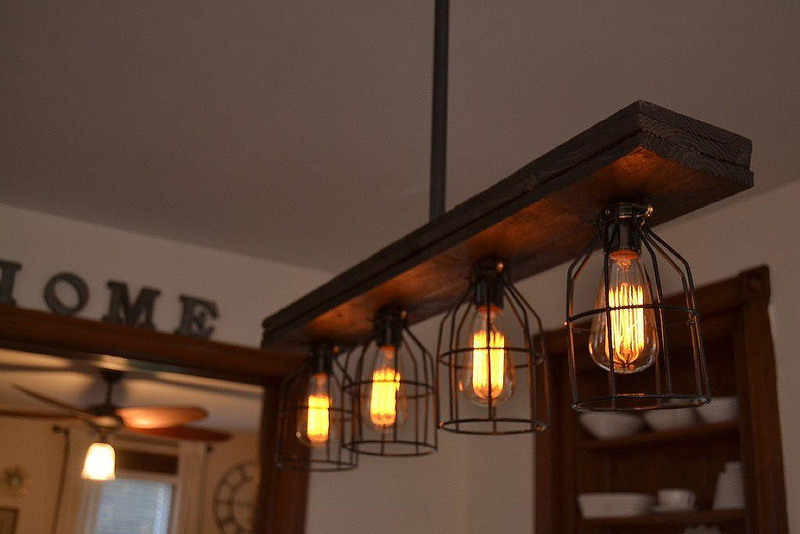 Industrial-Style Pendant Light Bar With Pulleys: Bring your kitchen or dining area back to the 20’s. 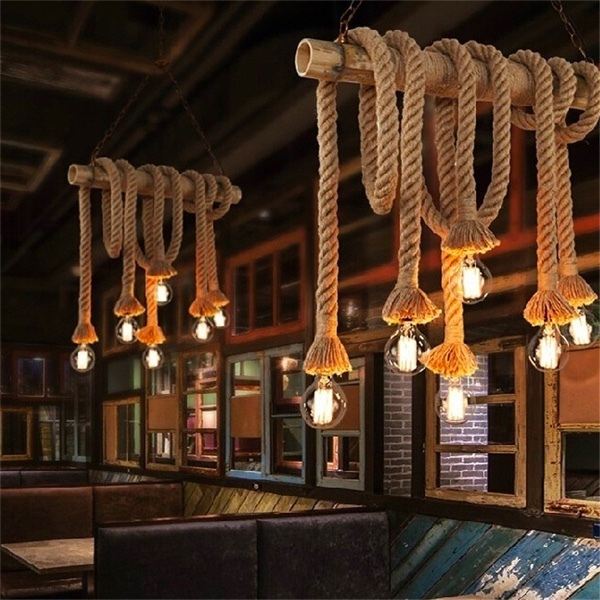 This pendant light bar with three lampshades hangs suspended by a pulley, a ceiling-bound look with an industrial twist. Industrial Light Bar: Looking for a less elegant solution to light up your kitchen? This caged bar find is hardwired for all countries and shipped straight from the USA. Industrial-Style Fixed Ceiling Light: Wrought iron forms the shape of a star, in this five-pronged design perfect for the porch. Its caged edges look a treat afront an antique-style abode. 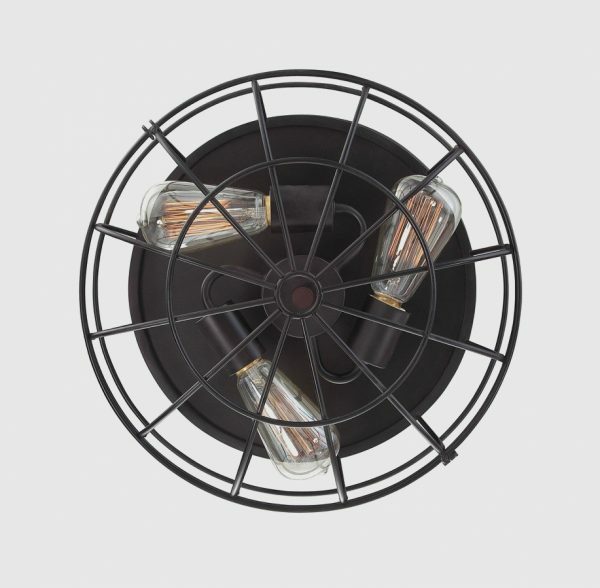 Artsy Industrial-Style Ceiling Light: Not sure of the direction your décor is headed? 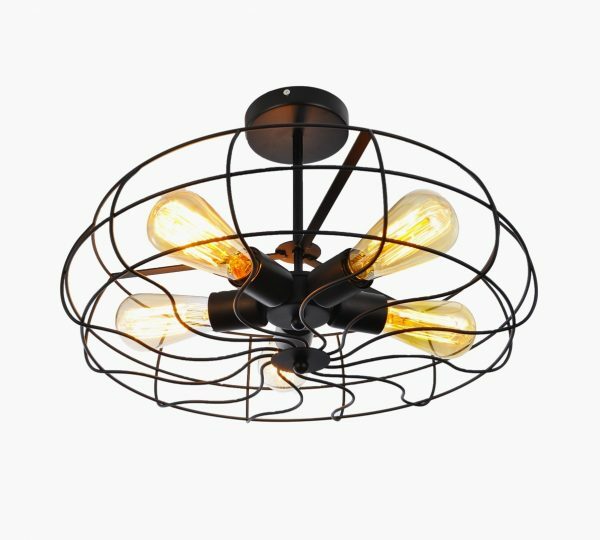 This industrial-style light spins off in all directions, while a black steel finish and two-year warranty keep it grounded in reality. 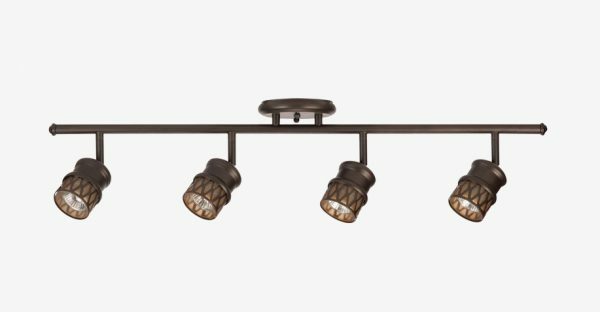 Industrial-Style Track Lighting: Set up your home like a movie scene, with this row of four lights mimicking those on film. 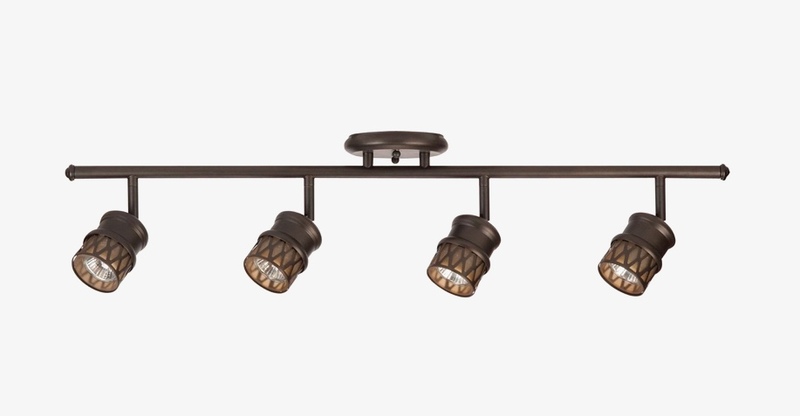 Fully dimmable, its champagne glass lights and oil-rubbed bronze suit a range of interiors. 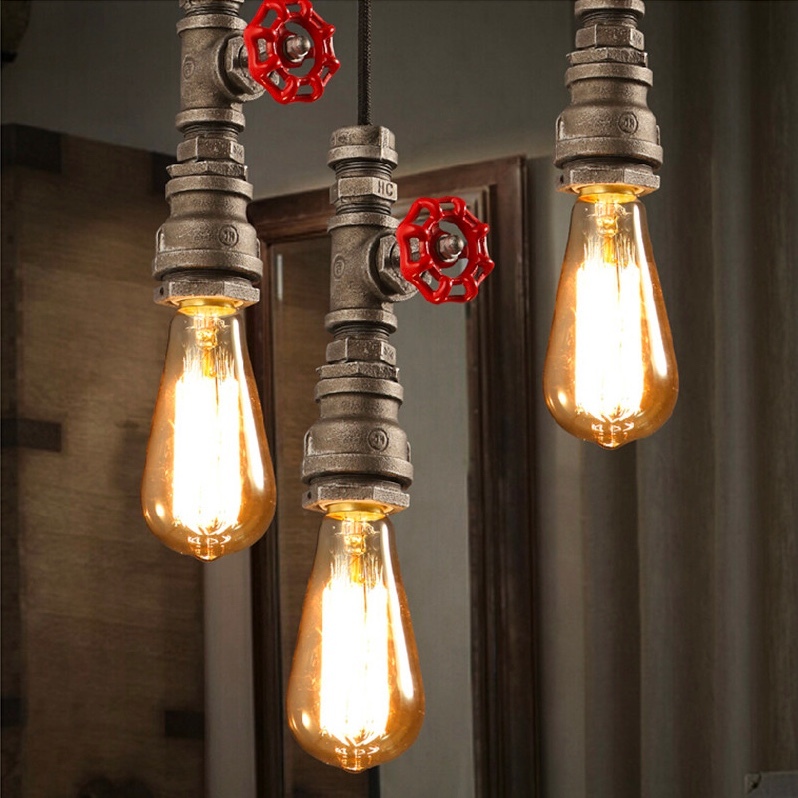 Industrial String Lights: 24.8 feet worth of cord can last up to 3,000 hours, in this hipster lantern find. Drape them over your porch for a magical invitation to your next dinner party. 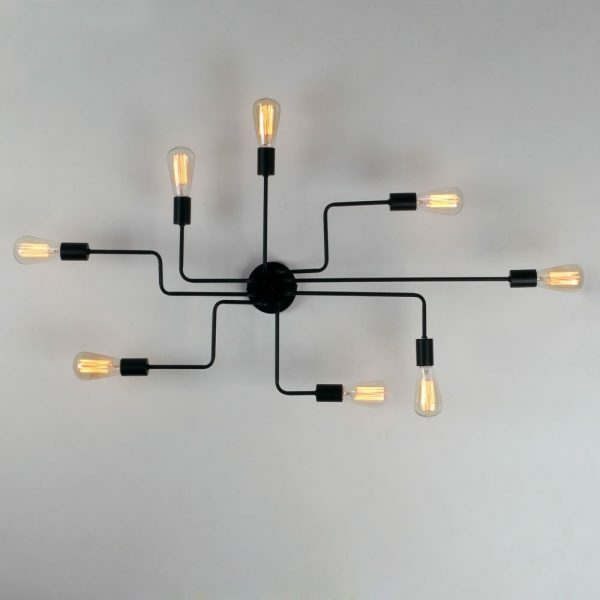 Industrial-Style Marquee Lights: Want your retro interior to make a splash? These LED-infused marquee lights make your home glow as if were on Broadway. Switch between flashing or non-flashing lights, while you spend time serving the hor d’oeuvres. 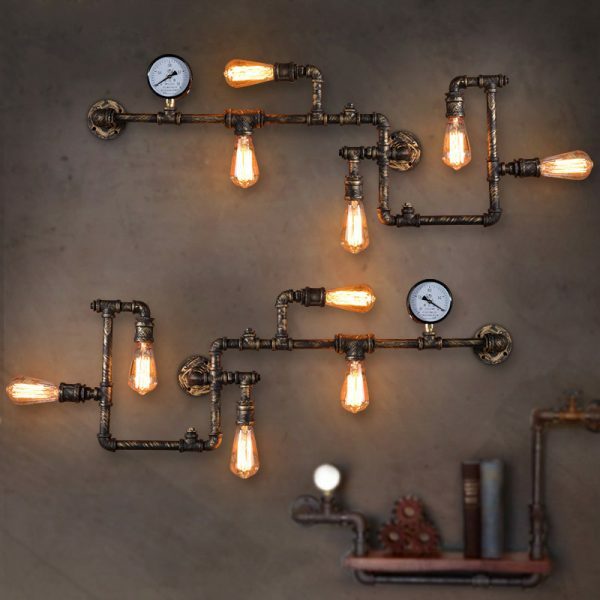 Wall-Fixed Artistic Pipe Lights: Brand new with a look of the old, these light fixtures made of piping add fuse gauges to their stems. 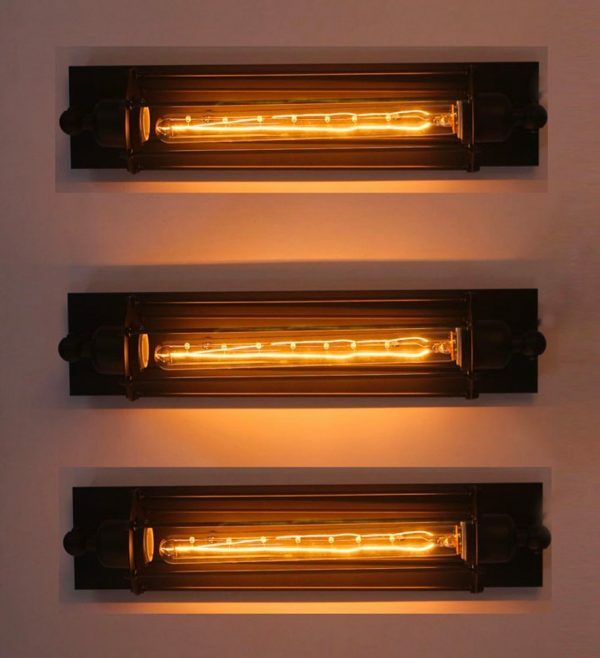 Hang their five lights upon your garage or office, for a Victorian approach to business. Caged Fan Five Prong Light: Keep your light close to your ceiling with this metal cage design. Five lights ensure each angle is covered. 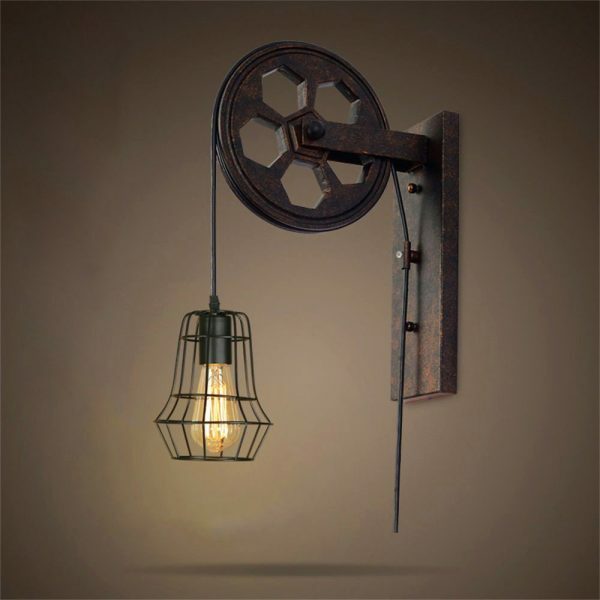 Industrial-Style Wall Sconces: Get the Victorian factory look, with a wall sconce mounted upon your wall. This artistic design offers an alternative to clinical-looking LEDs with its rolled barrel finish. Industrial-Style Bedside Wall Lamp: Black wrought iron steals the scene in this vertical light. Bulbs on either side create a sleek look unusual for industrial times. Industrial-Style Pulley Lamp: The lantern look moves inside, with this pulley lamp affixed to the wall. 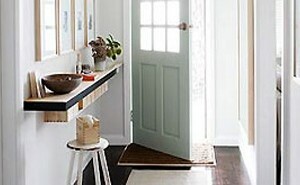 A metal grate based on painted wood sits well at your home entrance. Paint-Splattered Wall Lamp: Industrial lighting takes a new form, with this metal form splattered in artistic paint. Three lights and a wall mount provide an easy entrance into the world of the Victorian. Vintage Industrial Ceiling Light: An English bronze finish and stylized cage let these bulbs light up your ceiling. Replace your standard ceiling light with its industrial-inspired form. 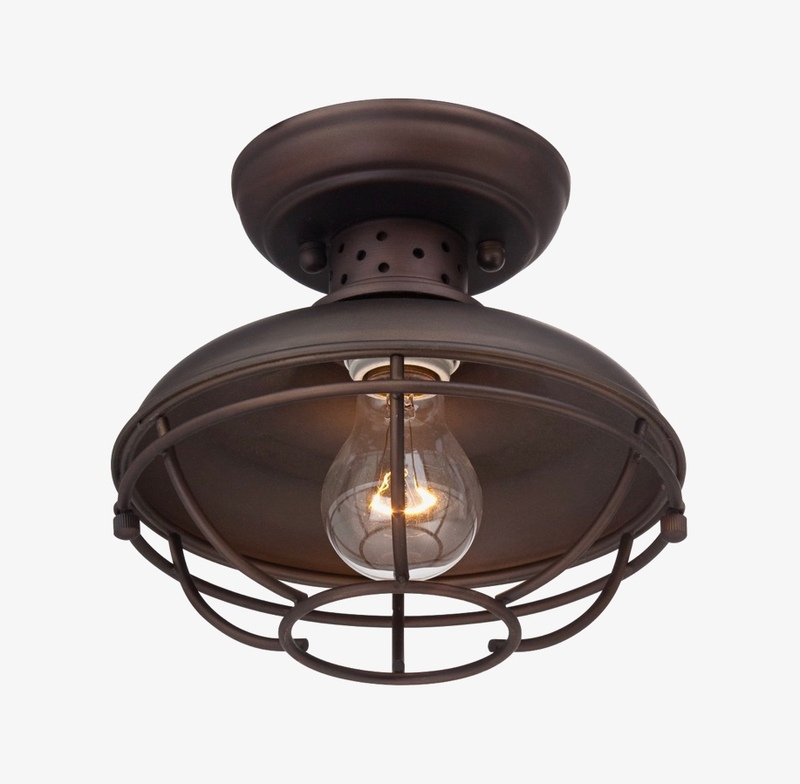 Industrial-Style Outdoor Ceiling Light: Inspired by the look of the barnhouse, this lamp lights up the outdoors. Hang it on your patio or porch, for an ambient entrance to your front door. 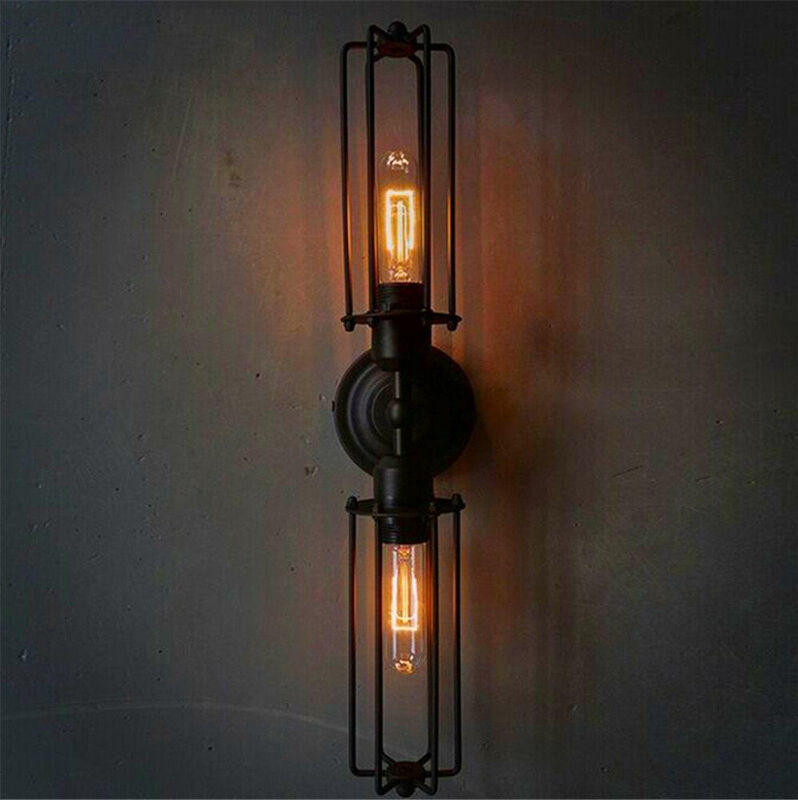 If you are looking for industrial style lighting elements, be sure to check out our Steampunk Home Decor post too as these too styles are closely related.